The external ear (now called the outer ear) is the outermost part of the hearing aid, consisting of the ear canal (popular ear) and the ear canal. The outer ear is internally delimited by the tympanic membrane (eardrum). The middle ear (now called the middle ear) begins shortly after the eardrum and is composed of the auditory ossicles and the Eustachian tube. The inner ear (now called the inner ear) is the deeper portion, composed of the cochlea and the vestibular apparatus. When a sound reaches our ears, it must pass through some structures of the auditory system so that it can reach the brain and be correctly interpreted. The vibrations of sound waves are captured by the tympanic membrane and transformed into mechanical stimuli by the auditory ossicles. The ossicles transmit these stimuli to the cochlea, which in turn delivers them to the auditory nerve, which leads to the brain. Lesions in the tympanum or ossicles can lead to hearing loss, as they interrupt the transmission of sound waves towards the auditory nerve. The Eustachian tube is a canal that connects the middle ear to the oropharynx. Its main function is to drain mucus and fluid and to regulate the air pressure inside the middle ear, preventing injuries of the tympanic membrane if the pressure in the ear is greater than the atmospheric pressure. The Eustachian tube is usually closed, but we can stimulate its opening, either by chewing or opening the mouth, simulating a yawn. When the tuba opens, the pressures of the environment and the middle ear are equalized (anyone who flew by plane can fully understand the function of this mechanism). 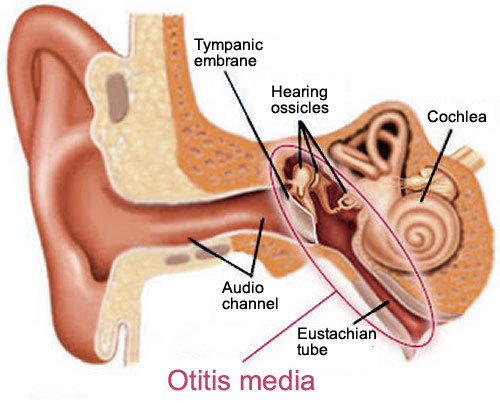 Acute otitis media is the inflammation and accumulation of fluid in the middle ear, usually caused by viral infections of the respiratory tract, such as colds or flu. These infections can cause a swelling in the mucous membranes of the nose and throat, reducing the body's natural defenses and eliminating bacteria from the nose. Viral respiratory tract infections may also impair the functioning of the Eustachian tube, favoring the accumulation of fluid within the middle ear. The lack of drainage of liquid favors the colonization of the same by bacteria, leading to infection and increased pressure of the middle ear. In children, the Eustachian tube is anatomically different from adults, being less angulated, which makes it difficult to open and favors its clogging in cases of respiratory infection. About 60% of children have at least one episode of otitis media during their first year of life. This rate rises to almost 90% by age three. Otitis media is not a contagious infection. No need to isolate the child. The main risk factor is age, with young children being the main victims. The peak incidence of otitis media occurs between 6 and 18 months of life. As the child grows, otitis will become more infrequent, although there is a new peak of incidence between the ages of 4 and 5. After the appearance of definitive teeth, the rate of otitis media drops dramatically. Adults may also have otitis media, but it is uncommon. The main symptoms of acute otitis media in children are fever, earache and temporary hearing loss. These symptoms usually come on suddenly. In infants and young children, the diagnosis may be more difficult, as the symptoms are less typical, and may include irritability, frequent pulling of the ear, apathy, lack of appetite, vomiting, diarrhea, or conjunctivitis. Drilling of the eardrum is one of the most common complications. The patient experiences a sudden relief of pain and improvement of hearing associated with the discharge of secretion through the ear (otorrhea), which may be clear, purulent or bloody. Perforation of the eardrum and otorrhea can last for weeks, leading to chronic suppurative otitis media, or simply disappear spontaneously after a few days. Through otoscopy (examination of the ear) the doctor can evaluate the eardrum, being able to notice the presence of inflation of the same and liquid inside the middle ear. The examination also allows to verify perforations in the tympanic membrane. Otoscopy does not hurt, but it is a difficult test to be done on children, since they do not usually accept the introduction of the device into the ear. Often the child gets so upset that the doctor can not perform the exam properly. A mild and temporary hearing loss is a common symptom of otitis media and usually improves after resolution of the condition. However, chronic or untreated otitis can cause significant and permanent hearing loss if there is any permanent damage to the eardrum or other structures of the middle ear. Most otitis media do not need to be treated with antibiotics, since much of it resolves spontaneously in 1 or 2 weeks. The indiscriminate use of antibiotics, in addition to being unnecessary in many cases, can lead to the selection of more resistant bacteria, which can make treatment difficult in cases where antibiotics are really necessary. Many patients can be treated with anti-inflammatory drugs alone. Antihistamines and nasal decongestants are not indicated. When antibiotics are indicated, amoxicillin is usually the drug of choice. Other options are amoxicillin + clavulanic acid, cefuroxime, or ceftriaxone. In patients allergic to penicillin and cephalosporins, the options are clarithromycin, azithromycin or erythromycin. Currently the vaccine schedule includes vaccines against some of the major bacteria and viruses that cause otitis media, such as Haemophilus influenza, Streptococcus pneumoniae (pneumococcus) and Influenza virus. These vaccines have been able to substantially reduce the incidence of otitis media.